(AP)  A massive Chevron oil refinery fire that sent hundreds of people rushing to hospitals and is pushing West Coast gas prices higher was just the latest pollution incident at the facility that records show has increasingly violated air quality rules over the past five years. The refinery is one of three such facilities near San Francisco that rank among California's top 10 emitters of toxic chemicals, according to the U.S. Environmental Protection Agency's Toxic Release Inventory. Chevron's Richmond refinery  the scene of Monday's fire that shrouded the area in black smoke  has been cited by San Francisco Bay area regulators for violating air regulations 93 times in the past five years. The number has increased from 15 violations in 2007 to 23 in both 2010 and 2011. The refinery is also the state's largest emitter of greenhouse gases, according to state regulators. The Richmond refinery produces about 150,000 barrels of gasoline a day  or 16 percent of the West Coast's daily gasoline consumption of 963,000 barrels, said Tom Kloza, chief oil analyst at Oil Price Information Service. With inventories of gasoline in the region already low compared with the rest of America, pump prices on the West Coast will soon average more than $1 a liter, Kloza said. Investigations continued Wednesday into Chevron's response to the fire and the effectiveness of Contra Costa County's emergency warning system. 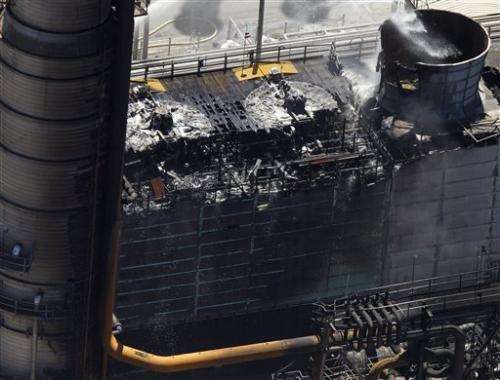 The U.S. Chemical Safety Board, a federal agency, sent a seven-member team to look into possible exposure of workers after vapor ignited and caused the fire. Monday wasn't the first time Richmond residents had received shelter-in-place orders to stay in their homes and close the doors and windows after fires or accidents at nearby refineries. 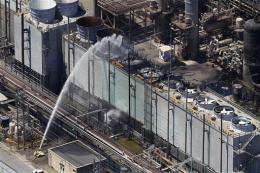 They were anxious about the latest fire, and reports of a minor, secondary fire at the refinery on Wednesday only magnified concerns. "Events like this most recent fire are a trigger for a longstanding mistrust of Chevron," said Jason Corburn, a University of California, Berkeley public health and urban planning professor. "People feel these spikes in air pollutants, and feel these dangerous events in the context of the daily (air quality issues) that don't show up on county air monitors." The Richmond facility is not the biggest violator of air quality laws among the region's five oil refineries, but it has been cited for violating air regulations numerous times. Some of the violations remain under investigation for determination of penalties. Chevron spokeswoman Melissa Ritchie said in an email that the refinery "places the highest priority on the health and safety of our work force, our neighbors and the protection of the environment." Some of the San Francisco Bay area's other refineries have more violations than Chevron. 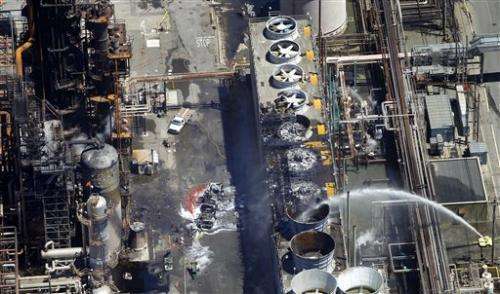 The most involved a Valero-owned refinery in nearby Benicia, which has 222 violations over the same five-year period. A Shell refinery in Martinez, a few miles (kilometers) east of the Chevron facility, posted the fewest violations with 83. Not all of the air violations were for exceeding legal limits on pollution emissions, said Brian Bateman, the district's health and science officer. Some, he said, can be for bad record-keeping or other administrative problems, as well as equipment problems. While the sprawling Chevron refinery has produced much of the West Coast's daily gasoline supply over the past dozen years, it has also emitted an average of 543,155 pounds (246,373 kilograms) of toxic chemicals into the air annually, according to EPA data. In 2010, all of the state's toxic emitters, including hazardous waste disposal sites combined, released more than 9 million pounds of toxic chemicals into the air. Chevron paid $170,000 to the air district for all of its violations between 2005 and 2009 after reaching a settlement. The total amount of fines for more recent violations has not been determined. The federal Clean Air Act sets limits on pollutants that refineries and other emitters can release and imposes penalties for violations. Local air districts enforce the law. While some of the region's 27 air monitoring station's detected an uptick in pollution during Monday's fire, further laboratory testing confirmed that the levels did not pose a significant health concern, the air district said. "... released more than 9 million pounds of toxic chemicals into the air." What's the nature of these toxic compounds? Things that are toxic are toxic to different degrees. Ditto persistence in the environment. I can't remember when fuel was under $1 a litre, $1.50 is about the norm within Brisbane and that's with 10% Ethanol. Head away from the capital and the price climbs. Sorry about the pollution but I do envy your fuel prices. I think there should be a global minimum fuel price of $1 per litre. People would think twice about buying ridiculous 20mpg tanks/rvs/minivans. Proceeds go towards righting enviromental wrongs such as this one. This refinery ought to be shut down immediately. So doing would cause an immediate rise of west coast gasoline to $10/gal (hopefully much more). With this accomplished the west coasters can continue to claim their fame as the county's most responsible environmentalists as price shock forces them to finally cut their use of gasoline (except for the Hollywood celebrities). West coasters want to preach environmentalism to the rest of us, therefore they should be first to put their money where their mouths are begging us to go & shutting down this damn refinery would be a good start, then they must enact legislation preventing oil from being extracted from the ground because of the strong suspicion oil depletion causes earthquakes. After I read West Coasters are finally paying their fair share price of $20 (preferably more, a lot more) for a gal of gasoline, then I will feel safe to move there because they will have convinced me they are serious about dealing with earthquakes. lol they actualy think they can prevent earthquakes?, seriously?. Arent they due a rather massive one in the next 20 years? Living 2000' from the actual #4 processor that ignited the vapor cloud, resulting in easily 100' flames and a 50' diameter boiling black cloud of hydrocarbons, our reaction was to slam the windows, pack the kid and scoot. Got some nice pix out the back window of the car. Chevron's attitude is that we can't live without them, so they do as they please. They're right, so far, but that black cloud actually dropped on the rich folks in and past the hills and made them sneeze and choke. Progress. We smelled nothing, since the heat drove the cloud up to what the helicopters called 2000' and light winds moved it to the hills.